I tried this recipe from The Comfort of Cooking & tweeked it slightly because The Hubs is allergic to oranges. Anyway it came out AMAZING!! Highly recomment it!! Place chicken in a rimmed 13-in. x 9-in. baking dish. Pour olive oil mixture all over chicken, turning pieces to coat all sides. Add chicken with all liquid to pan (even in marinating in liquid). Place parts skin side up and spread them out evenly in the pan. 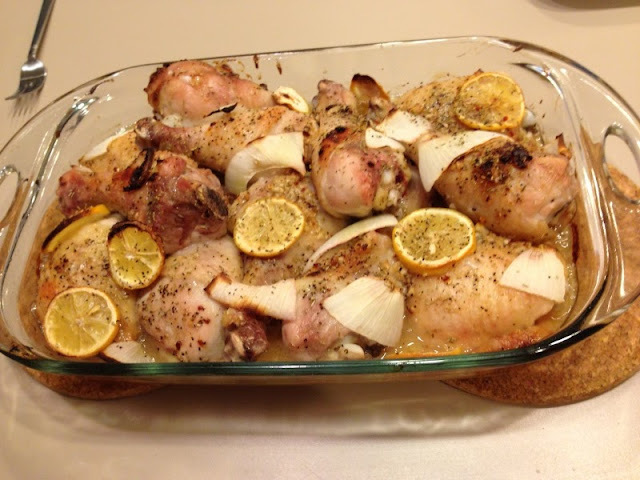 Arrange slices of lemon and onion around and under the chicken. Sprinkle all over generously with thyme, rosemary, salt and pepper. Here's what mine looked like when it came out of the oven... Delish!